TCR gene therapy is adversely affected by newly formed TCRαβ heterodimers comprising exogenous and endogenous TCR chains that dilute expression of transgenic TCRαβ dimers and are potentially self-reactive. We have addressed TCR mispairing by using a modified two-chain TCR that encompasses total human CD3ζ with specificities for three different Ags. Transfer of either TCRα:CD3ζ or β:CD3ζ genes alone does not result in surface expression, whereas transfer of both modified TCR chains results in high surface expression, binding of peptide-MHC complexes and Ag-specific T cell functions. Genetic introduction of TCRαβ:ζ does not compromise surface expression and functions of an endogenous TCRαβ. Flow cytometry fluorescence resonance energy transfer and biochemical analyses demonstrate that TCRαβ:CD3ζ is the first strategy that results in highly preferred pairing between CD3ζ-modified TCRα and β chains as well as absence of TCR mispairing between TCR:CD3ζ and nonmodified TCR chains. Intracellular assembly and surface expression of TCR:CD3ζ chains is independent of endogenous CD3γ, δ, and ε. Taken together, our data support the use of TCRαβ:CD3ζ to prevent TCR mispairing, which may provide an adequate strategy to enhance efficacy and safety of TCR gene transfer. Adoptive transfer of Ag-specific T lymphocytes has recently shown clinical success in the treatment of viral infections and tumors (1, 2, 3, 4). We and others have demonstrated that transfer of TCRαβ genes into T cells (i.e., genetic T cell retargeting) represents a feasible and attractive alternative to provide tumor-specific immunity (5, 6, 7, 8, 9), and at the same time circumvents the laborious nature and limited success of isolating and expanding tumor-reactive T cells from patients ex vivo. Currently, gene transduction and T cell expansion procedures have been optimized (10), meet good clinical practice criteria, and are implemented in various phase I trials using patient-derived autologous T cells gene-modified with Ab-based receptors (11, 12). More recently, TCR gene therapy to treat metastatic melanoma patients has been pursued, showing that TCR gene transfer is a safe strategy but appears limited by an objective response rate of 12% (13). One way to enhance the efficacy of TCR gene therapy is to improve the avidity of TCR-transduced T cells, which is often compromised when compared with parental CTL clones. It has been observed that high-avidity CTL provide better protection against viral infections because target cells are recognized at lower Ag densities and initiate lysis more rapidly when compared with low-avidity CTL (14). T cell avidity can be improved significantly by selecting TCR chains with appropriate ligand-binding affinity (15), the use of optimal retroviral transfer vectors and strategies that address gene silencing in vivo (16, 17). In addition, T cell avidity would benefit from enhanced surface expression levels of TCR transgenes (7, 18). In fact, introduced TCRα and β transgenes can assemble with endogenously present TCR chains (i.e., TCR mispairing) and thereby dilute the surface expression level of TCR transgenes (9). Consequently, TCR mispairing impairs the avidity of the transduced T cell population toward the target Ag of interest due to a reduction in the density of the desired TCRαβ on the cell surface and may result in compromised T cell activation (19) and efficient tumor killing (7, 18). Furthermore, mispairing of TCR chains may result in possible formations of self-reactive TCRαβ heterodimers and as such adversely affects the safety of treatments with TCR-transduced T lymphocytes. To date, various strategies have been reported that have attempted to address TCR mispairing, such as introduction of cysteine residues at structurally favorable positions in TCR-Cα and β (20) and replacement of human TCR constant domains by the corresponding murine domains (i.e., huV:muC) (21). Pairing between TCR chains modified by either one of these strategies is at best preferential to some extent for certain TCR-V regions, most likely due to stabilized TCR/CD3 conformations (20, 21), whereas it is not preferential for other TCR-V regions when compared with nonmodified TCR (22). We have previously reported on modified TCRα and β chains in which the original constant domains downstream of the extracellular cysteine (which mediates the interchain disulphide bridge) have been replaced with complete human CD3ζ (i.e., TCRαβ:CD3ζ), and provided flow cytometry data suggesting an inability of the modified TCR chains to mispair with the endogenous TCR chain and correct pairing of these TCR chains in primary human T cells (6). In the current study, we have not only extended this observation to three sets of TCRs, but more importantly provided novel and direct evidence of a highly preferred pairing between TCRα:ζ and β:ζ chains using fluorescence resonance energy transfer (FRET)3 flow cytometry supplemented with classical flow cytometry, biochemistry, and functional analyses. The TCRαβ:CD3ζ format does not compete with endogenous TCRαβ chains for available CD3 elements, and when compared with nonmodified TCRαβ transgenes, shows high surface expression on T cells, potently mediates intracellular signaling, and does not compromise surface expression and signaling of an already present TCRαβ. Importantly, surface expression and function of TCRαβ:CD3ζ have been extensively validated in primary human T cells and this receptor format functionally retargets T cells toward tumor cells positive for various MHC-restricted tumor and viral Ags (6, 22, 23). Jurkat T cells and the B cell blast cell lines BSM and APD were cultured in RPMI 1640 medium containing 10% FBS (Stonehouse), streptomycin (100 μg/ml), and penicillin (100 U/ml). The human embryonic kidney cell line 293T, the packaging cell line Phoenix-A as well as the MAGE-A1+/HLA-A1+ melanoma cell line MZ2-MEL.3.0 (provided by Drs. T. Boon and P. Coulie, Christian de Duve Institute of Cellular Pathology, Université catholique de Louvain, Brussels, Belgium) were cultured in DMEM medium (BioWhittaker) supplemented with 10% FBS, 2 mM l-glutamine, and antibiotics. T lymphocytes derived from healthy donors were isolated and expanded as described elsewhere (23). mAbs used for flow cytometry and FACSort comprise nonconjugated and FITC-conjugated anti-TCR Vα19 mAb (Pierce Biotechnology); FITC-conjugated anti-TCR Vβ27 (Coulter-Immunotech); and PE-conjugated anti-TCR Vβ9, Vβ12, Vβ27, and Vβ2 mAbs (Coulter-Immunotech). Abs used for immune precipitation (IP) and immune detection include anti-TCR Vβ9 mAb (BL37.2; Coulter-Immunotech), anti-CD3γ mAb (HMT-3.2) (24), anti-CD3δ mAb (APA-1.2) (24), two anti-CD3ε mAbs (OKT3, Sanquin; and M-20, Santa Cruz Biotechnology), anti-CD3ζ mAb (488) (25), and HRP-conjugated sheep anti-mouse or donkey anti-goat IgG (Amersham Biosciences). Other reagents used in this study were: RetroNectin (human fibronectin fragments CH-296; Takara Shuzo), hgp100280–288 (YLEPGPVTA)/HLA-A*0201, MAGE-1 (EADPTGHSY)/HLA-A*0101, EBNA-4 (IVTDFSVIK)/HLA-A*1101, and Melan-A (ELAGIGILTV)/HLA-A*0201 pentamers (all obtained from Proimmune); PMA (Sigma-Aldrich); and ionomycin (Calbiochem). MelanA/MART1-specific and HLA-A2-restricted TCRαβ (MelA/A2 TCR) cDNA was derived from the MelA peptide-specific CTL clone SELA-A 64 (26), and sequence characterization identified TRAV12-2/J35/C and TRBV27/D2/J2-7/C2 gene usage. The MelA peptide-specific CTL clone SELA-A 64 was treated with TRIzol (Invitrogen) for total RNA isolation, which was converted to cDNA by reverse transcription using oligo-dT primer and Moloney murine leukemia virus reagent (Invitrogen). Full-length TCRαβ-encoding genes were PCR amplified, inserted into pCR2.1 TOPO vectors (Invitrogen), and sequenced. Complete TCRα and β sequences were cloned between XbaI and SalI sites of a self-inactivating HIV-1-based vector (pRRL.sin18.cPPT.CMV.GFP.Wpre, abbreviated as CMV.GFP and described in more detail elsewhere (27)), obtaining CMV.TCRα and CMV.TCRβ, respectively. The lentiviral packaging plasmid pCMVΔR8.74 (28), devoid of all HIV-1 accessory genes, and the plasmid hCMV-G (29) were used to produce TCR-containing and VSV-G envelope-pseudotyped lentiviruses following calcium-phosphate transfection of 293T cells. The virus-containing supernatants were filtered through 0.45-μm filters, concentrated 30-fold by centrifugation at 104,000 × g for 2 h at 4°C and resuspended in DMEM. Viral particle concentrations were measured by HIV-1 p24 protein ELISA (Innogenetics) and ranged from 0.5–3 μg of p24/ml, which was equivalent to 0.5–1 × 105 therapeutic use/ng p24. Lentiviral TCR gene transfer into TCR-negative Jurkat T cells was performed by mixing 2 × 105 cells with 1 ml of concentrated viral supernatant in the presence of 8 μg/ml protamine sulfate (Sigma-Aldrich). Nontransduced T cells (mock) were used as a negative control. T cells were transduced in a first 6-h cycle with pCMV-TCRα containing viral supernatant, washed, and transduced in a second 6-h cycle with pCMV-TCRβ (both cycles at 37°C/5% CO2). Cells were allowed to recover in fresh culture medium. Seventy-two hours following transduction, T cells were plated and cultured under limiting dilution conditions in 96-well microtiter plates. T cell clones were screened for TCR expression by flow cytometry, and clone J.19 was selected and expanded based on high peptide-MHC (pMHC) binding (99% tetramer-positive T cells). Stability of TCR expression (pMHC binding) and function (TCR-dependent Ca2+ signaling) was confirmed over the period this clone was used for the experiments described (>12 mo). TCRα and β DNAs were obtained by PCR using template cDNA from the CTL clones MZ2-82/30 (specificity: MAGE-A1/HLA-A1; TCR gene usage: TRAV19/J39/C and TRBV9/D2/J2-3/C2), MPD (specificity: gp100/HLA-A2; TCR gene usage: TRAV30/J49/C and TRBV12-4/D2/J2-1/C2), and BK289 (specificity: EBNA-4/HLA-A11; TCR gene usage: TRAV8-1/J45/C and TRBV2/D2/J2-1/C2) (6, 9, 30). TCR-V(D)J gene nomenclature is according to http://imgt.cines.fr. TCRαβ:ζ specific for MAGE-A1, gp100, and EBNA-4 were constructed by linking the extracellular domains of the TCR α and β chain to the complete human CD3ζ molecule (i.e., VαCαζ and VβCβζ) as described previously (6, 31, 32). TCRαβ and TCRαβ:ζ cDNAs were cloned into pBullet retroviral vectors, and used to transduce either TCR-negative or MelA/A2 TCR-positive Jurkat T cells (i.e., clone J.19). VSV-G envelope-pseudotyped Moloney murine leukemia virus retroviruses that contain TCR RNAs were produced by a coculture of the packaging cells 293T and Phoenix-A following calcium-phosphate transfections. The transduction procedure used was optimized for human T cells and described by Lamers et al. (10). In short, 24-well culture plates were coated with RetroNectin and pretreated with TCR-positive retroviral particles. Next, 106 T cells/well were centrifuged in fresh retrovirus containing supernatant, and cultured for 4–5 h at 37°C/5% CO2. Cells were allowed to recover in culture medium overnight before a second transduction cycle, after which cells were harvested and transferred to T25 culture flasks. After sufficient numbers were obtained, cells were analyzed for TCR expression by flow cytometry. TCR-transduced Jurkat T cells (5 × 105) were analyzed for transgene expression by flow cytometry using FITC-conjugated anti-TCR mAb (Vα19 or Vβ27), PE-conjugated anti-TCR mAb (Vβ2, Vβ9, Vβ12, or Vβ27) or R-PE-conjugated pMHC multimers (M1/A1, gp100/A2, EBNA-4/A11, or MelA/A2). Cells were incubated with mAbs on ice for 30 min, or pMHC multimers at room temperature for 15 min. Analysis was performed on a Cytomics FC-500 flow cytometer (Beckman Coulter). Enrichment of Jurkat T cells expressing M1/A1 TCRαβ or TCRαβ:ζ in the presence or absence of MelA-A2 TCRαβ was performed by two-color FACS following staining with anti-TCR-Vα19 and Vβ9 mAbs. Flow cytometry-based FRET is performed principally as described previously (33), and fluorophores were selected on the basis of optical properties of the dyes and the available excitation wavelengths of the flow cytometer (34). mAb were directly labeled with Cy3- and Cy5-monoreactive sulfoindocyanine N-hydroxysuccinimidyl ester-conjugated dyes (Amersham Biosciences) according to the manufacturer's specifications. Dye-to-protein labeling efficiencies were determined spectrophotometrically and ratios of 3:1 were considered appropriate for FRET applications. In brief, FRET was performed as follows. Cell samples were stained either with 1) anti-TCR-Vα19 mAb followed by Cy5-conjugated goat-anti-mouse IgG Fab (acceptor) and Cy3-conjugated anti-TCR-Vβ9 mAb (donor); 2) anti-TCR-Vα19 mAb followed by Cy3-conjugated goat-anti-mouse IgG Fab (donor) and Cy5-conjugated anti-TCR-Vβ9 mAb (acceptor); 3) anti-TCR-Vα19 mAb followed by Cy5-conjugated goat-anti-mouse IgG Fab (acceptor) and PE-conjugated anti-TCR-Vβ27 mAb (donor); or 4) Cy5-conjugated anti-CD3ε mAb (acceptor) and Cy3-conjugated anti-TCR-Vβ9 (donor). Fluorescence intensities were subsequently measured on a FACSCalibur dual-laser flow cytometer (BD Biosciences). Emissions at 570 nm (donor channel, excitation at 488 nm), 670 nm (acceptor channel, excitation at 635 nm), and over 670 nm (FRET channel, excitation at 488 nm) were collected. Data were analyzed with the FLEX software on a per cell basis (35). TCR-transduced Jurkat T cells (25 × 106) were lysed in 10 mM Tris-Cl (pH 7.6), 150 mM NaCl, 2 mM EDTA, and 0.5% Brij96 (Sigma-Aldrich) for 30 min on ice in the presence of protease inhibitors (protease inhibitor mixture Complete; Roche Applied Science). Cleared lysates were immune precipitated either with anti-TCR-Vβ9, anti-CD3γ (HMT-3.2), anti-CD3δ (APA-1.2), anti-CD3ε (OKT-3) or anti-CD3ζ (488) Abs overnight at 4°C followed by protein G Sepharose coated with rabbit-anti-mouse IgG for 1 h at 4°C. The immune precipitates were washed, loaded, and run on 7–17% Tris-HCl gels, and transferred to nitrocellulose membranes (Whatman) under wet conditions. 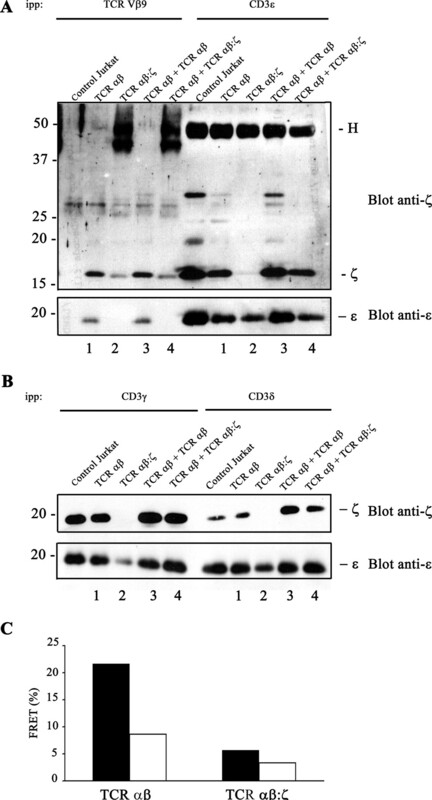 The membranes were subsequently used for immune detection with anti-CD3ε (M20) or anti-CD3ζ (488) Abs for 3 h at room temperature, followed by peroxidase-labeled sheep anti-mouse or donkey anti-goat IgG (1:2,500; Amersham Bioscience) for 30 min at room temperature and developed via chemiluminescence (SuperSignal West Pico Chemiluminescent Substrate; Pierce). For reporter gene assays, exponentially growing Jurkat T cells were transiently transfected by nucleofection with an Amaxa nucleofector (Amaxa Biosystems) according to the manufacturer's instructions. A total of 5 × 106 cells were resuspended in 100 μl of buffer V (Amaxa Biosystems), after which 10 μg of an NFAT-luciferase construct (containing six NFAT-binding sites followed by a minimal IL-2 promoter and TATA box, synthesized by Base Clear) and 1 μg of the β-galactosidase construct was added and cells were pulsed with the Nucleofector set at S-10. After transfection, the cells were immediately put into 2 ml of fresh culture medium in wells of 12-well plates and incubated at 37°C/5% CO2. Twenty hours posttransfection, Jurkat T cells were transferred to round-bottom 96-well plates (Costar) at 2 × 105 cells in 200 μl/well and were stimulated with anti-TCR Vβ mAbs in RPMI 1640 medium supplemented with 10% BCS for 6 h at 37°C/5% CO2. Wells were precoated with anti-TCRVβ9 mAb, anti-TCRVβ27 mAb, or control murine Ig (at 0.1 μg/well final), and stimulations with PMA (10 ng/ml) and ionomycin (1 μM) served as positive controls. After stimulation, T cells were collected, lysed with cell lysis buffer (Promega), and luciferase and β-galactosidase activities were assessed using chemiluminescent substrates according to the manufacturer's instructions (Mediators). Samples were analyzed in a 96-well plate luminometer (Mediators), and luciferase activities were normalized on the basis of β-galactosidase activities and expressed (in relative light units (RLU)) relative to nonstimulated conditions (medium only: set to 1.0). Cytolytic activity of human T lymphocytes was measured in 4-h 51Cr-release assays as described previously (36). Percentage-specific 51Cr release was calculated as follows: ((test counts − spontaneous counts)/(maximum counts − spontaneous counts)) × 100%. To examine TCR mispairing and study how gene transfer of TCRαβ or TCR αβ:CD3ζ affects the surface expression and function of an existing TCRαβ, we generated a dual TCR Jurkat T cell model. This model is schematically presented in Fig. 1⇓, and is based on a Jurkat T clone expressing Melan-A/HLA-A2 TCRαβ (MelA/A2 TCR) as a first TCR and acting as a recipient T cell for gene transfer of MAGE1/HLA-A1-specific TCRαβ or TCRαβ:CD3ζ (M1/A1 TCRαβ or TCRαβ:ζ) as a second TCR. In a first experiment, we confirmed surface expression of M1/A1 TCRα19 or β9 chains in MelA/A2 TCR-positive Jurkat T cells following genetic introduction of either a TCRα or β chain as a measure of TCR mispairing (Fig. 2⇓A and Table I⇓). Surface expression of M1/A1 TCRα19 or β9 chains can only result from mispaired TCR heterodimers constituting MelA/A2 TCRα and M1/A1 TCRβ or vice versa. Consequently, the introduction of M1/A1 TCRβ9 limits the surface expression level of MelA/A2 TCRβ27 as a result of competition between the two TCRβ chains for the only available MelA/A2 TCRα12 chain (Fig. 2⇓A and Table I⇓). In fact, a decreased surface expression of the first TCRαβ upon TCRαβ gene transfer may represent an indirect measurement (i.e., a surrogate marker) of TCR mispairing. Note that the validity of this assay was confirmed by FRET analyses which show that in the context of dual TCR T cells the TCRβ27 truly mispairs with the introduced TCRα chain (see Fig. 5⇓C). Strikingly, genetic introduction of only TCRα:ζ or β:ζ neither result in surface expression of the M1/A1 TCRα19:ζ or β9:ζ chain nor in a decreased expression level of MelA/A2 TCRβ27 chain (Fig. 2⇓B and Table I⇓). Interestingly, T cells transduced with TCRα:ζ and β:ζ show a unique and extended diagonal dot plot when stained with the corresponding anti-TCR-Vα19 and Vβ9 Abs, indicative of coordinated expression of both TCR chains and most likely contributing to enhanced surface expression of TCRαβ:ζ (Fig. 2⇓B). 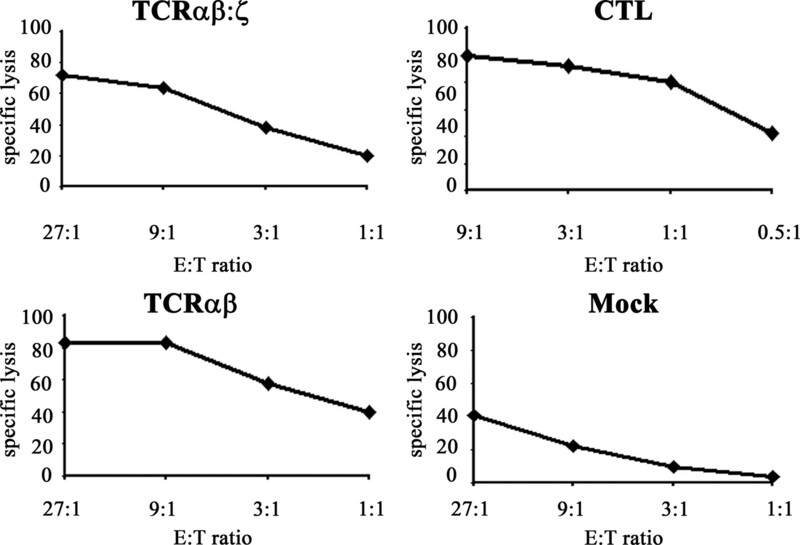 Mean fluorescence intensities (MFI) of anti-TCR Vα19 mAbFITC and Vβ9 mAbPE stainings of T cells gene-transferred with either TCRαβ- or TCRαβ:ζ-expressing dual TCR T cells support this conclusion (Table I⇓). In addition, gene transfer of TCRα:ζ and β:ζ does not compromise the surface expression of the already present TCRαβ and results in T cells coexpressing both TCRs. Percentages and MFIs of MelA/A2 TCRαβ-positive T cells were reduced almost 2-fold when gene-transferring M1/A1 TCRαβ (percent of TCRβ27-positive T cells changed from 94 to 49 and MFI from 5.6 to 1.7) but were nonaffected when gene-transferring M1/A1 TCRαβ:ζ (percent changed from 94 to 92 and MFI from 5.6 to 5.3). Double immunofluorescent stainings with pMHC multimers and anti-TCRα or β Abs extended these observations and showed little surface coexpression (up to 20%) of noncorresponding M1/A1 and MelA/A2 TCR chains in TCRαβ-transduced T cells. In contrast, there was clear coexpression (up to 80%) of these TCR chains in TCRαβ:ζ-transduced T cells (Fig. 3⇓: percentages correspond to fraction of M1/A1 TCR-positive T cells (set to 100% and highlighted by black rectangles) that coexpress MelA/A2 TCR). Our findings that M1/A1 TCRαβ:ζ does not pair with endogenous TCRαβ and shows enhanced surface expression were extended to a set of three TCRαβs. Next to M1/A1, we tested TCRαβ and TCRαβ:ζ specific for gp100/HLA-A2 (gp100/A2 TCR) and EBNA4/HLA-A11 (EBNA4/A11 TCR) in our dual TCR T cell model. For all three Ag specificities, dual TCR T cells only showed a statistically significant decreased surface expression of MelA/A2 TCRαβ when gene-transferred with TCRαβ but not TCRαβ:ζ (Fig. 4⇓ and Table II⇓, endogenous TCR). Consequently, and again independent of Ag specificity used, TCRαβ:ζ showed enhanced surface expression levels in dual TCR T cells when compared with the corresponding nonmodified TCRαβ (Table II⇓, exogenous TCR). To extend our flow cytometry data and provide direct evidence that TCRα:ζ and β:ζ transgenes pair correctly, we used flow cytometry-based FRET as a measure of molecular distance (i.e., extent of TCR pairing) between TCRα and β chains. MelA/A2 TCRαβ-positive Jurkat T cells were transduced with M1/A1 TCRαβ or αβ:ζ and were labeled with donor and acceptor conjugated Abs that corresponded either to correctly paired TCR transgenes (i.e., TCR-Vα19 and Vβ9 mAbs) or mispaired TCR transgenes (i.e., TCR-Vα19 and Vβ27 mAbs). It is important to note that FRET efficiencies >5% represent a significant association between the TCR chains under study, in case their surface expression levels are in a normal range (5 × 104–5 × 105 molecules per cell) and the applied fluorophores express average brightness. FRET efficiencies <5%, although not implying that there is no pairing of TCR chains, do not allow distinction between significant and nonsignificant interactions due to energy transfer by chance and experimental error (34, 37, 38). FRET values of Jurkat T cells expressing only M1/A1 TCRαβ or αβ:ζ (single TCR T cells) were used as a reference for correct and format-independent TCR pairing. In a dual TCR setting, we observed that correct pairing of M1/A1 TCR chains was statistically significantly impaired when introducing TCRαβ but remained unchanged (relative to single TCR T cells) when introducing TCRαβ:ζ (Fig. 5⇓, A and B). 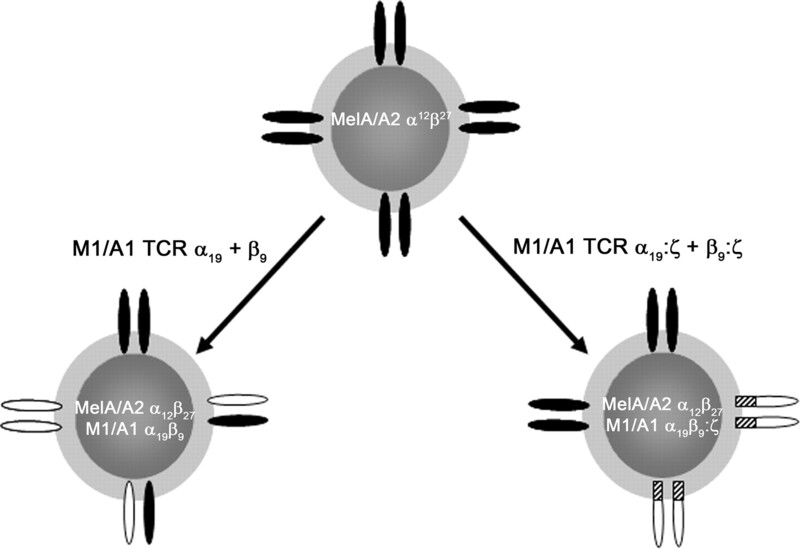 Consequently, TCR mispairing was only evident between M1/A1 TCRα and MelA/A2 TCRβ, but not between M1/A1 TCRα:ζ and MelA/A2 TCRβ:ζ, the latter combination showing background levels of energy transfer (Fig. 5⇓C). Direct proof of lack of mispairing between TCRα19:ζ and β27 confirmed the observation that surface expression of TCRβ27 is not affected as a consequence of TCRαβ:ζ gene transfer (Fig. 2⇑B). Moreover, the histogram distribution of FRET values, being broad and showing left-handed shoulders in the case of M1/A1 TCRαβ, suggests that the majority of, but not all, M1/A1 TCRα chains mispair. 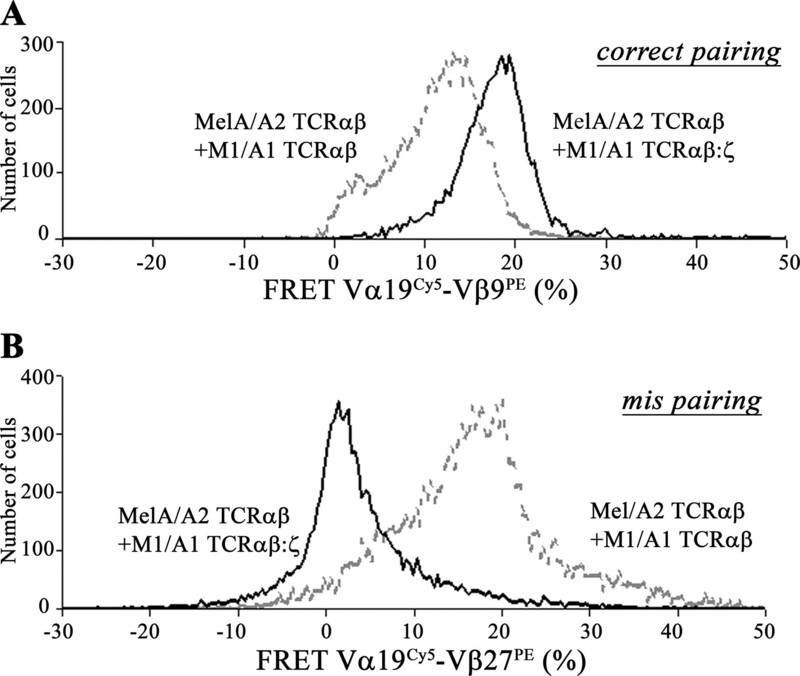 In contrast, measurements based on M1/A1 TCRαβ:ζ result in homogenous FRET histograms confirming a uniform pairing of TCRα:ζ and β:ζ (Fig. 6⇓). To better understand the mechanism underlying the highly preferred pairing between TCRα:ζ and β:ζ transgenes, we decided to study the TCR/CD3 stoichiometry as a consequence of TCR format. First, cell lysates of TCR-transduced Jurkat T cells were immunoprecipitated with either anti-TCRVβ9, CD3γ, CD3δ, or CD3ε Abs (Figs. 7⇓, A and B). Following gel electrophoresis, Western blotting, and immunodetection with anti-CD3ε Ab, we observed that TCRαβ, but not TCRαβ:ζ, complexes associate with CD3ε, independent of the presence of a second TCRαβ (see IP with anti-TCRVβ9 mAb) (Fig. 7⇓A). As expected, CD3γε and CD3δε complexes were present in all samples (see IP with anti-CD3γ and δ Abs) (Fig. 7⇓B). Probing blots with anti-CD3ζ Ab revealed that endogenous CD3ζ forms complexes with TCRαβ, but only to a limited extent with TCRαβ:ζ, and that CD3ζ was associated with CD3γ, CD3δ, and CD3ε in TCRαβ, but not TCRαβ:ζ complexes (Fig. 7⇓, A and B). These co-IP experiments point to an assembly between TCRαβ:ζ and a limited amount of endogenous CD3ζ that is independent of CD3γ, δ, or ε. Second, we confirmed the absence of CD3ε from intracellular TCRαβ:ζ complexes at the surface level by FRET analysis (Fig. 7⇓C). It is noteworthy that CD3ε is the only CD3 component with an extracellular epitope accessible for flow cytometry, thereby enabling the analysis described. 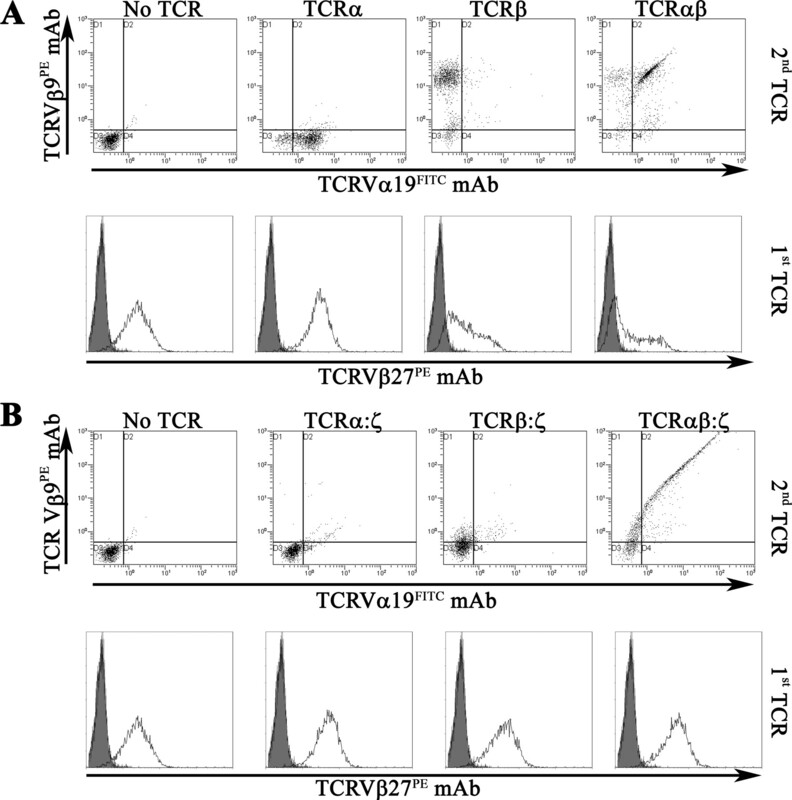 Following labeling of TCR-transduced T cells with donor- and acceptor-conjugated anti-TCRVβ9 and CD3ε Abs, clear energy transfer was only detected for TCRαβ but not TCRαβ:ζ (Fig. 7⇓C). TCRαβ:ζ assembly and surface expression is independent of endogenous CD3γ, CD3δ and CD3ε. A, M1/A1 TCRαβ or TCRαβ:ζ are introduced in either TCR-negative Jurkat T cells (nos. 1 and 2, respectively) or Jurkat T cell that already express a MelA/A2 TCRαβ (nos. 3 and 4, respectively). TCR-transduced Jurkat T cells were enriched by FACS using anti-TCR-Vα19 and TCRVβ9 mAbs (specific for M1/A1 TCR). Cells were lysed in Brij96 and IP with one of the following Abs (A) BL37.2 (TCR-Vβ9), OKT3 (CD3ε-containing dimers) and (B) HMT 3.2 (CD3γ) and APA 1.2 (CD3δ). Immunoprecipitates were subjected to 7–17% SDS-PAGE, transferred to nitrocellulose and immunoblotted with either anti-CD3ε mAb (M20) or anti-CD3ζ Ab 448. H, indicates Ig H chain. ∗, The presence of TCRαβ:ζ. This blot represents one of two independent experiments with similar results. C, TCR-negative Jurkat T were transduced with M1/A1 TCRαβ or TCRαβ:ζ and enriched by FACS using anti-TCR-Vα19 and TCRVβ9 mAbs. T cells were double-stained either with Cy3-labeled anti-TCR Vβ9 (BL37.2) and Cy5-labeled anti-CD3ε (OKT3) (▪) or Cy3-labeled anti-CD3ε and Cy5-labeled anti-TCR Vβ9 (□) and analyzed for FRET efficiency by flow cytometry as described in the legend to Fig. 5⇑. FRET values represent one of two independent experiments with similar results. Next, the function of TCRαβ:ζ and its effect on that of endogenous TCRαβ was tested in dual TCR T cells. To this end, TCR-mediated activation of NFAT was analyzed in Jurkat T cells following stimulation with TCRβ-specific Abs. NFAT activation upon stimulation with anti-TCR Vβ9 mAb was 1.7-fold higher in T cells expressing M1/A1 TCRαβ:ζ relative to TCRαβ (Fig. 8⇓). Furthermore, NFAT activation through M1/A1 TCRαβ was decreased whereas activation through M1/A1 TCRαβ:ζ was not affected in the presence of MelA/A2 TCRαβ; again, a 2.2-fold difference was observed when comparing TCRαβ:ζ vs TCRαβ. 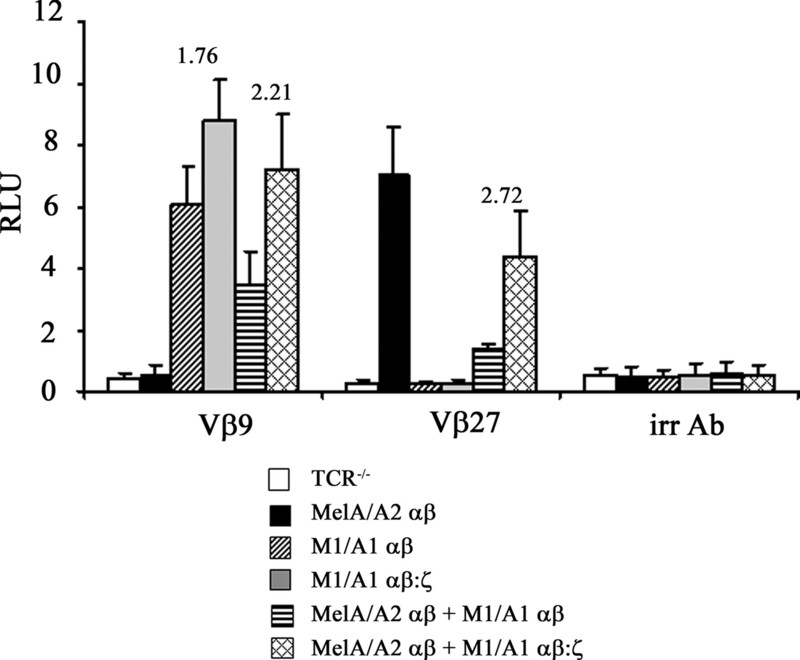 The function of MelA/A2 TCRαβ was measured following stimulation with anti-TCR Vβ27 mAb and appeared similarly sensitive to the format of the introduced TCR genes. NFAT activation through MelA/A2 TCRαβ is somewhat decreased but clearly detectable in M1/A1 TCRαβ:ζ-transduced T cells, whereas it is almost absent and comparable to activation upon stimulation with irrelevant IgG in M1/A1 TCRαβ-transduced T cells. Here, Jurkat T cells expressing TCRαβ:ζ showed a 2.7-fold higher level of NFAT activation upon activation with anti-TCR-Vβ27 mAb than Jurkat T cells expressing TCRαβ (Fig. 8⇓). Differences observed between TCRαβ and TCRαβ:ζ in their ability to activate NFAT following stimulation paralleled their ability to affect NFAT activation upon stimulation of another TCRαβ, and are considered to be due to intrinsic properties of the TCR format. In extension to NFAT activation in TCR-transduced Jurkat T cells, we have tested primary human T cells transduced with either M1/A1 TCRαβ or TCRαβ:ζ in chromium release assays. Fig. 9⇓ shows that T cells transduced with either TCR displayed comparable cytotoxic activity toward M1/A1-positive MZ2-MEL3.0 melanoma cells as target cells. The parental CTL clone 82/30 and mock-transduced T cells were included as positive and negative controls, respectively. TCR mispairing is a recognized phenomenon in the field of TCR gene therapy, which may result in the generation of autoreactive TCRs, albeit momentarily a theoretical risk, but clearly results in a diluted level of surface expressed TCR transgenes. A strategy to address TCR mispairing would therefore not only avoid the generation of unknown TCR specificities but also result in enhanced surface expression of TCR transgenes and consequently yield T cells with higher avidity for the Ag of interest (or equivalent TCR expression/T cell avidity using a lower virus titer). The present study provides proof for highly preferred pairing between TCRα and β chains that are fused to the extracellular, transmembrane, and intracellular domains of human CD3ζ and that these TCRαβ:ζ chains do not pair with already present TCRαβ, resulting in improved surface expression levels and Ag-specific functions, while not affecting expression and function of an already present TCRαβ. The following two strategies have been reported previously to address TCR mispairing. First, introduction of cysteines at structurally favorable positions in TCR-Cα and β (20) and second, replacement of TCR-C domains by the corresponding murine C domains (i.e., huV:muC) (21). Cysteine modification or murinization of TCR-Cα and β chains results in enhanced binding of pMHC as a measure of correct TCRαβ pairing, and consequently in enhanced Ag-specific functions. A combination of both cysteine modification and murinization is reported to further improve binding of pMHC- and Ag-specific functions (39). A third strategy pursued to address TCR mispairing is represented by the introduction of reciprocal mutations in the TCR-C domains that prohibit binding to noncorresponding TCR chains, and although such a strategy is molecularly feasible it results in mutated TCR chains that express and functionally perform less than nonmodified TCR chains (55). TCR surface expression following gene transfer of only one modified TCR (α or β) chain modified by either one of these strategies or a combination of a modified TCR chain and the corresponding nonmodified TCR chain resulted in a reduced yet clearly detectable surface expression when compared with nonmodified TCRαβ chains (20, 21). In addition, the ability of these modified TCRs to address TCR mispairing appears to depend on the TCR-V regions of the nonmodified TCR chains (22). In contrast, TCRα:ζ and TCRβ:ζ do not mispair with endogenous TCRαβ as evidenced by nonsurface expression of either of these chains following gene transfer of only one modified TCR chain and show a high and coordinated surface expression following gene transfer of both TCRα:ζ and TCRβ:ζ chains (Fig. 2⇑ and Table I⇑). These data confirm our earlier findings (6) and were extended to three sets of TCRαβs. Using TCRs specific for M1/A1, gp100/A2, and EBNA4/A11, we observed that the surface expression of an endogenous TCRαβ (MelA/A2 TCR) was not compromised upon gene transfer of TCRαβ:ζ but not TCRαβ (Fig. 4⇑ and Table II⇑, endogenous TCR). Consequently, the expression of the introduced TCRαβ:ζ was enhanced when compared with TCRαβ for all three Ag specificities (Table II⇑, exogenous TCR). Importantly, TCRαβ genetically linked to CD3ζ represents the first strategy for which direct evidence is provided for highly preferred pairing between TCRα:ζ and TCRβ:ζ using flow cytometry FRET and Abs directed either to corresponding or noncorresponding TCRα and β chains. 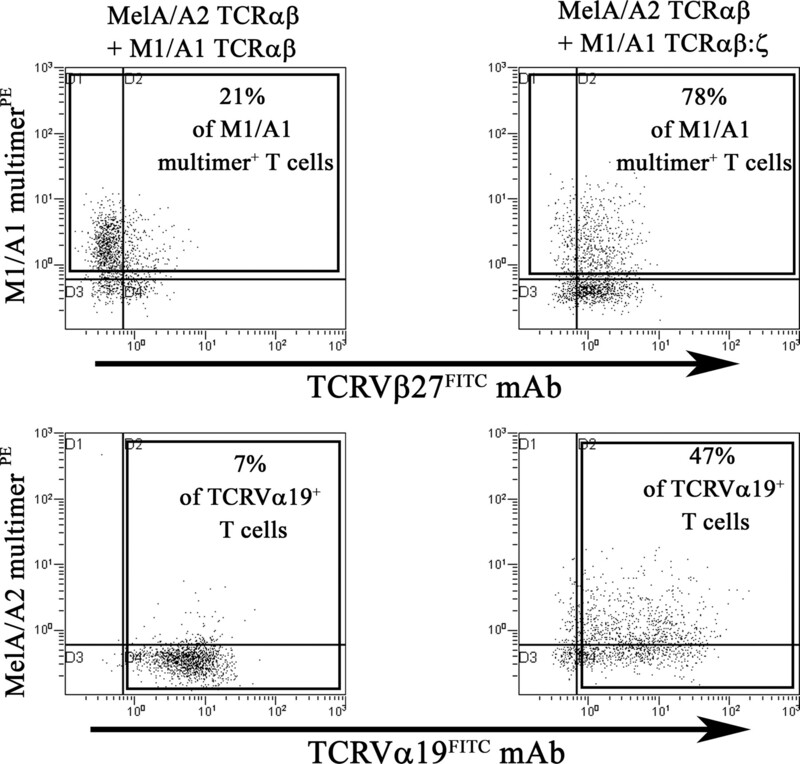 The energy transfer between corresponding TCR chains (i.e., M1/A1 TCRα19 and β9) is significantly decreased in the case of TCRαβ but not TCRαβ:ζ when comparing dual vs single TCR T cells (Fig. 5⇑, A and B). Vice versa, the energy transfer between noncorresponding TCR chains (i.e., M1/A1 TCRα19 and Mel/A2 TCRβ27) was only significantly detectable in case of TCRαβ but not TCRαβ:ζ (Fig. 5⇑C). Moreover, the histogram distribution of energy transfer values for TCRαβ:ζ, being homogenous and having a small width points to a more uniform pairing of TCRαβ:ζ when compared with TCRαβ (see Fig. 6⇑). We believe that TCRαβ:ζ successfully prevents TCR mispairing, although one cannot exclude that depending on TCR-V domains TCRαβ:ζ may pair to a small extent with some TCRαβ, as suggested by a small but not statistically significant down-regulation of MelA/A2 TCRαβ following introduction of TCRαβ:ζ specific for EBNA4/A11 (see Fig. 4⇑ and Table II⇑, endogenous TCR). Co-IP and FRET analyses point to an assembly between TCRαβ:ζ and a limited amount of endogenous CD3ζ that is independent of CD3γδε (Fig. 7⇑). CD3-independent assembly/surface expression of TCRαβ:ζ may explain why this TCR format successfully prevents TCR mispairing and consequently results in high TCR surface expression. The TCR/CD3 complex is composed of different single-spanning transmembrane proteins: the TCRαβ heterodimer that is responsible for pMHC ligand recognition, and the noncovalently associated CD3γε, CD3δε, and CD3ζζ dimers. Upon ligand binding, a change in the conformation of the TCR with respect to the membrane is a likely first step in TCR signaling (40), thereby establishing a molecular platform for productive TCR engagement, allowing recruitment of Nck, CD3-ITAM phosphorylation, and subsequent docking and activation of a large number of signaling components (41, 42, 43). The assembly of the TCR/CD3 complex is governed by interactions between the transmembrane domains of TCRαβ and CD3 dimers, and to some extent by interactions between ectodomains (40, 44). The interaction between CD3δε and an extracellular loop in TCR-Cα helps stabilize CD3γε within the complex (which interacts with a TCR-Cβ loop) and contributes to TCR-mediated signaling. Pairs of acidic transmembrane residues present in the CD3 dimers contact the basic TCR transmembrane residues (K and R) and direct TCR:CD3 assembly. In case of the TCRαβ:ζ, the extracellular TCR loops are present but the transmembrane domains of TCRα and β are replaced by those of CD3ζ, thereby providing residues including a cysteine that induces dimerization between TCRα:ζ and β:ζ and at the same time prevent TCR docking of CD3δε and CD3γε dimers. TCRαβ:ζ (or CD3ζ for that matter) does not recruit CD3γδε which ensures expression of functional ER retention signals of CD3 assembly intermediates (45) and refrains CD3γε and CD3δε dimers from surface expression. Therefore, total TCRαβ:ζ surface expression appears not to be regulated by accessory molecules such as CD3 components and, as a consequence is regulated differently in comparison to total surface expression of nonmodified TCRαβ. In support of this notion, TCRαβ:ζ but not TCRαβ expresses at the surface of non-T cells (i.e., epithelial retroviral packaging cells 293T; data not shown). Some TCRs, as determined by their TCR-V regions, only show weak surface expression and are not able to replace other TCRs on the cell surface (41, 42). These TCRs, but not more dominant TCRs, are expected to benefit most from cysteine modification and/or murinization to result in exchange of Ag specificity following TCR gene transfer (46, 47). In contrast, TCRαβ:ζ does not compete for available CD3 subunits and appears not dominant over an endogenous TCRαβ because both TCRs are coexpressed in a dual TCR T cells (see Fig. 3⇑), making the TCRαβ:ζ strategy more universal with respect to TCR-V regions. In addition, the enhanced surface expression and function of TCRαβ:ζ may be linked to TCR-interacting molecule, an adaptor molecule that normally associates with CD3ζ and contributes to TCR expression and signaling (48). Also, the absence of glycosylation sites that are normally present in TCR-Cα and β (a total of four sites in human TCRαβ) may result in enhanced expression and avidity of TCRαβ:ζ (55). To analyze the TCRαβ:ζ format in more detail, it is important to note that the TCRα:ζ and β:ζ chains contain the cysteine residues responsible for the interchain disulphide bridge, but the extracellular connecting peptide motif, transmembrane and intracellular domains of TCRα and β are replaced by CD3ζ. Connecting peptide motifs α and β may affect the calcium pathway (49, 50), the transmembrane and intracellular domains of TCRβ may recruit the adaptor CARMA-1 which feeds into the NF-κB pathway (51), and the intracellular tail of TCRα may affect CD3γ phosphorylation and TCR down-regulation (52). Because each of the replaced domains is reported to contribute to Ag-specific responses in murine T cells, we functionally analyzed TCRαβ:ζ in dual TCR T cells. We observed that TCRαβ:ζ mediates potent NFAT activation and does not compromise NFAT activation of an already present TCRαβ in dual TCR Jurkat T cells (Fig. 8⇑), which makes it unlikely for TCRαβ:ζ to mediate impaired calcium signaling because calcium is a necessary upstream mediator of NFAT activation. In fact, TCRαβ:ζ results in enhanced NFAT activation when compared with nonmodified TCRαβ (Fig. 8⇑), possibly due to phosphorylation of three ITAMs, downstream activation of phospholipase Cγ1 and calcium mobilization. Although we cannot exclude that TCRαβ:ζ affects NF-κB signaling and/or TCR down-regulation, this TCR has been extensively validated for tumor Ag-specific responses in primary human T cells such cytotoxicity and IFN-γ and TNF-α production (see Fig. 9⇑ and Refs. 6 , 31 , 32). Also, TCR:CD8α interactions were studied in primary human T cells by FRET and revealed no differences between TCRαβ:ζ and TCRαβ (data not shown). In fact, these findings extend earlier observations that T cells are operational in the absence of CD3 components and/or their phosphorylation motifs (53, 54). Current research aims at reintroduction of those TCR domains into the TCRαβ:ζ format that are responsible for association with endogenous CD3 components in an effort to generate a modified TCR that shows an improved functional versatility as well as an ability to down-regulate the expression of endogenous TCR and thereby limiting, at least theoretically, the self-reactivity of ignorant T cells (those T cells that have escaped mechanisms of tolerance). In closing, the TCRαβ:ζ successfully prevents TCR mispairing, shows high surface expression on T cells, mediates Ag-specific functions in primary T cells, and does not compromise surface expression and function of an already present TCRαβ. This TCR format warrants further studies into TCR engineering to improve safety and efficacy of TCR gene therapy. ↵3 Abbreviations used in this paper: FRET, fluorescence resonance energy transfer; IP, immune precipitation; pMHC, peptide-MHC; RLU, relative light unit; MFI, mean fluorescence intensity. Walter, E. A., P. D. Greenberg, M. J. Gilbert, R. J. Finch, K. S. Watanabe, E. D. Thomas, S. R. Riddell. 1995. Reconstitution of cellular immunity against cytomegalovirus in recipients of allogeneic bone marrow by transfer of T-cell clones from the donor. N. Engl. J. Med. 333: 1038-1044. Savoldo, B., H. E. Heslop, C. M. Rooney. 2000. The use of cytotoxic t cells for the prevention and treatment of Epstein-Barr virus induced lymphoma in transplant recipients. Leuk. Lymphoma 39: 455-464. Yee, C., J. A. Thompson, D. Byrd, S. R. Riddell, P. Roche, E. Celis, P. D. Greenberg. 2002. Adoptive T cell therapy using antigen-specific CD8+ T cell clones for the treatment of patients with metastatic melanoma: in vivo persistence, migration, and antitumor effect of transferred T cells. Proc. Natl. Acad. Sci. USA 99: 16168-16173. Dudley, M. E., J. R. Wunderlich, J. C. Yang, R. M. Sherry, S. L. Topalian, N. P. Restifo, R. E. Royal, U. Kammula, D. E. White, S. A. Mavroukakis, et al 2005. Adoptive cell transfer therapy following non-myeloablative but lymphodepleting chemotherapy for the treatment of patients with refractory metastatic melanoma. J. Clin. Oncol. 23: 2346-2357. Clay, T. M., M. C. Custer, J. Sachs, P. Hwu, S. A. Rosenberg, M. I. Nishimura. 1999. Efficient transfer of a tumor antigen-reactive TCR to human peripheral blood lymphocytes confers anti-tumor reactivity. J. Immunol. 163: 507-513. Willemsen, R. A., M. E. Weijtens, C. Ronteltap, Z. Eshhar, J. W. Gratama, P. Chames, R. L. Bolhuis. 2000. Grafting primary human T lymphocytes with cancer-specific chimeric single chain and two chain TCR. Gene Ther. 7: 1369-1377.
Cooper, L. J., M. Kalos, D. A. Lewinsohn, S. R. Riddell, P. D. Greenberg. 2000. Transfer of specificity for human immunodeficiency virus type 1 into primary human T lymphocytes by introduction of T-cell receptor genes. J. Virol. 74: 8207-8212. Orentas, R. J., S. J. Roskopf, G. P. Nolan, M. I. Nishimura. 2001. Retroviral transduction of a T cell receptor specific for an Epstein-Barr virus-encoded peptide. Clin. Immunol. 98: 220-228. Schaft, N., R. A. Willemsen, J. de Vries, B. Lankiewicz, B. W. Essers, J. W. Gratama, C. G. Figdor, R. L. Bolhuis, R. Debets, G. J. Adema. 2003. Peptide fine specificity of anti-glycoprotein 100 CTL is preserved following transfer of engineered TCR αβ genes into primary human T lymphocytes. J. Immunol. 170: 2186-2194. Lamers, C. H., R. A. Willemsen, P. van Elzakker, B. A. van Krimpen, J. W. Gratama, R. Debets. 2006. Phoenix-ampho outperforms PG13 as retroviral packaging cells to transduce human T cells with tumor-specific receptors: implications for clinical immunogene therapy of cancer. Cancer Gene Ther. 13: 503-509. Lamers, C. H., S. Sleijfer, A. G. Vulto, W. H. Kruit, M. Kliffen, R. Debets, J. W. Gratama, G. Stoter, E. Oosterwijk. 2006. Treatment of metastatic renal cell carcinoma with autologous T-lymphocytes genetically retargeted against carbonic anhydrase IX: first clinical experience. J. Clin. Oncol. 24: e20-e22. Kershaw, M. H., J. A. Westwood, L. L. Parker, G. Wang, Z. Eshhar, S. A. Mavroukakis, D. E. White, J. R. Wunderlich, S. Canevari, L. Rogers-Freezer, et al 2006. A phase I study on adoptive immunotherapy using gene-modified T cells for ovarian cancer. Clin. Cancer Res. 12: 6106-6115. Morgan, R. A., M. E. Dudley, J. R. Wunderlich, M. S. Hughes, J. C. Yang, R. M. Sherry, R. E. Royal, S. L. Topalian, U. S. Kammula, N. P. Restifo, et al 2006. Cancer regression in patients after transfer of genetically engineered lymphocytes. Science 314: 126-129. Derby, M., M. Alexander-Miller, R. Tse, J. Berzofsky. 2001. High-avidity CTL exploit two complementary mechanisms to provide better protection against viral infection than low-avidity CTL. J. Immunol. 166: 1690-1697. Chames, P., R. A. Willemsen, G. Rojas, D. Dieckmann, L. Rem, G. Schuler, R. L. Bolhuis, H. R. Hoogenboom. 2002. TCR-like human antibodies expressed on human CTLs mediate antibody affinity-dependent cytolytic activity. J. Immunol. 169: 1110-1118. Willemsen, R. A., R. Debets, P. Chames, R. L. Bolhuis. 2003. Genetic engineering of T cell specificity for immunotherapy of cancer. Hum. Immunol. 64: 56-68. Lamers, C. H., J. W. Gratama, N. M. Pouw, S. C. Langeveld, B. A. Krimpen, J. Kraan, G. Stoter, R. Debets. 2005. Parallel detection of transduced T lymphocytes after immunogene therapy of renal cell cancer by flow cytometry and real-time polymerase chain reaction: implications for loss of transgene expression. Hum. Gene Ther. 16: 1452-1462. Weijtens, M. E., E. H. Hart, R. L. Bolhuis. 2000. Functional balance between T cell chimeric receptor density and tumor associated antigen density: CTL mediated cytolysis and lymphokine production. Gene Ther. 7: 35-42. Viola, A., A. Lanzavecchia. 1996. T cell activation determined by T cell receptor number and tunable thresholds. Science 273: 104-106. Kuball, J., M. L. Dossett, M. Wolfl, W. Y. Ho, R. H. Voss, C. Fowler, P. D. Greenberg. 2007. Facilitating matched pairing and expression of TCR-chains introduced into human T-cells. Blood 109: 2331-2338. Cohen, C. J., Y. Zhao, Z. Zheng, S. A. Rosenberg, R. A. Morgan. 2006. Enhanced antitumor activity of murine-human hybrid T-cell receptor (TCR) in human lymphocytes is associated with improved pairing and TCR/CD3 stability. Cancer Res. 66: 8878-8886. Thomas, S., S. A. Xue, M. Cesco-Gaspere, E. San José, D. P. Hart, V. Wong, R. Debets, B. Alarcon, E. Morris, H. J. Stauss. 2007. Targeting the Wilms tumor antigen 1 by TCR gene transfer: TCR variants improve tetramer binding but not the function of gene modified human T cells. J. Immunol. 179: 5803-5810. Van de Griend, R. J., B. A. van Krimpen, S. J. Bol, A. Thompson, R. L. Bolhuis. 1984. Rapid expansion of human cytotoxic T cell clones: growth promotion by a heat-labile serum component and by various types of feeder cells. J. Immunol. Methods 66: 285-298. Alarcon, B., S. C. Ley, F. Sanchez-Madrid, R. S. Blumberg, S. T. Ju, M. Fresno, C. Terhorst. 1991. The CD3-γ and CD3-δ subunits of the T cell antigen receptor can be expressed within distinct functional TCR/CD3 complexes. EMBO J. 10: 903-912. San José, E., A. G. Sahuquillo, R. Bragado, B. Alarcon. 1998. Assembly of the TCR/CD3 complex: CD3 ε/δ and CD3 ε/γ dimers associate indistinctly with both TCR α and TCR β chains: evidence for a double TCR heterodimer model. Eur. J. Immunol. 28: 12-21. Mandruzzato, S., E. Rossi, F. Bernardi, V. Tosello, B. Macino, G. Basso, V. Chiarion-Sileni, C. R. Rossi, C. Montesco, P. Zanovello. 2002. Large and dissimilar repertoire of Melan-A/MART-1-specific CTL in metastatic lesions and blood of a melanoma patient. J. Immunol. 169: 4017-4024. Van den Driessche, T., L. Thorrez, L. Naldini, A. Follenzi, L. Moons, Z. Berneman, D. Collen, M. K. Chuah. 2002. Lentiviral vectors containing the human immunodeficiency virus type-1 central polypurine tract can efficiently transduce nondividing hepatocytes and antigen-presenting cells in vivo. Blood 100: 813-822. Dull, T., R. Zufferey, M. Kelly, R. J. Mandel, M. Nguyen, D. Trono, L. Naldini. 1998. A third-generation lentivirus vector with a conditional packaging system. J. Virol. 72: 8463-8471. Yee, J. K., T. Friedmann, J. C. Burns. 1994. Generation of high-titer pseudotyped retroviral vectors with very broad host range. Methods Cell Biol. 43: (Pt. A):99-112. Campos-Lima, P. O., V. Levitsky, M. P. Imreh, R. Gavioli, M. G. Masucci. 1997. Epitope-dependent selection of highly restricted or diverse T cell receptor repertoires in response to persistent infection by Epstein-Barr virus. J. Exp. Med. 186: 83-89. Schaft, N., B. Lankiewicz, J. W. Gratama, R. L. Bolhuis, R. Debets. 2003. Flexible and sensitive method to functionally validate tumor-specific receptors via activation of NFAT. J. Immunol. Methods 280: 13-24. Schaft, N., B. Lankiewicz, J. Drexhage, C. Berrevoets, D. J. Moss, V. Levitsky, M. Bonneville, S. P. Lee, A. J. McMichael, J. W. Gratama, et al 2006. T cell re-targeting to EBV antigens following TCR gene transfer: CD28-containing receptors mediate enhanced antigen-specific IFNγ production. Int. Immunol. 18: 591-601. Sebestyen, Z., P. Nagy, G. Horvath, G. Vamosi, R. Debets, J. W. Gratama, D. R. Alexander, J. Szollosi. 2002. Long wavelength fluorophores and cell-by-cell correction for autofluorescence significantly improves the accuracy of flow cytometric energy transfer measurements on a dual-laser benchtop flow cytometer. Cytometry 48: 124-135. Horvath, G., M. Petras, G. Szentesi, A. Fabian, J. W. Park, G. Vereb, J. Szollosi. 2005. Selecting the right fluorophores and flow cytometer for fluorescence resonance energy transfer measurements. Cytometry A 65: 148-157. Szentesi, G., G. Horvath, I. Bori, G. Vamosi, J. Szollosi, R. Gaspar, S. Damjanovich, A. Jenei, L. Matyus. 2004. Computer program for determining fluorescence resonance energy transfer efficiency from flow cytometric data on a cell-by-cell basis. Comput. Methods Programs Biomed. 75: 201-211. Weijtens, M. E., R. A. Willemsen, E. H. Hart, R. L. Bolhuis. 1998. A retroviral vector system “STITCH” in combination with an optimized single chain antibody chimeric receptor gene structure allows efficient gene transduction and expression in human T lymphocytes. Gene Ther. 5: 1195-1203. Szollosi, J., P. Nagy, Z. Sebestyen, S. Damjanovicha, J. W. Park, L. Matyus. 2002. Applications of fluorescence resonance energy transfer for mapping biological membranes. J. Biotechnol. 82: 251-266. Vereb, G., J. Matko, J. Szollosi. 2004. Cytometry of fluorescence resonance energy transfer. Methods Cell Biol. 75: 105-152. Cohen, C. J., Y. F. Li, M. El Gamil, P. F. Robbins, S. A. Rosenberg, R. A. Morgan. 2007. Enhanced antitumor activity of T cells engineered to express T-cell receptors with a second disulfide bond. Cancer Res. 67: 3898-3903. Kuhns, M. S., M. M. Davis. 2007. Disruption of extracellular interactions impairs T cell receptor-CD3 complex stability and signaling. Immunity 26: 357-369. Gil, D., W. W. Schamel, M. Montoya, F. Sanchez-Madrid, B. Alarcon. 2002. Recruitment of Nck by CD3 epsilon reveals a ligand-induced conformational change essential for T cell receptor signaling and synapse formation. Cell 109: 901-912. Exley, M., C. Terhorst, T. Wileman. 1991. Structure, assembly and intracellular transport of the T cell receptor for antigen. Semin. Immunol. 3: 283-297. Call, M. E., J. Pyrdol, K. W. Wucherpfennig. 2004. Stoichiometry of the T-cell receptor-CD3 complex and key intermediates assembled in the endoplasmic reticulum. EMBO J. 23: 2348-2357. Call, M. E., J. Pyrdol, M. Wiedmann, K. W. Wucherpfennig. 2002. The organizing principle in the formation of the T cell receptor-CD3 complex. Cell 111: 967-979. Delgado, P., B. Alarcon. 2005. An orderly inactivation of intracellular retention signals controls surface expression of the T cell antigen receptor. J. Exp. Med. 201: 555-566. Sommermeyer, D., J. Neudorfer, M. Weinhold, M. Leisegang, B. Engels, E. Noessner, M. H. Heemskerk, J. Charo, D. J. Schendel, T. Blankenstein, et al 2006. Designer T cells by T cell receptor replacement. Eur. J. Immunol. 36: 3052-3059. Heemskerk, M. H., R. S. Hagedoorn, M. A. van der Hoorn, L. T. van der Veken, M. Hoogeboom, M. G. Kester, R. Willemze, J. H. Falkenburg. 2007. Efficiency of T-cell receptor expression in dual-specific T cells is controlled by the intrinsic qualities of the TCR chains within the TCR-CD3 complex. Blood 109: 235-243. Kirchgessner, H., J. Dietrich, J. Scherer, P. Isomaki, V. Korinek, I. Hilgert, E. Bruyns, A. Leo, A. P. Cope, B. Schraven. 2001. The transmembrane adaptor protein TRIM regulates T cell receptor (TCR) expression and TCR-mediated signaling via an association with the TCR ζ chain. J. Exp. Med. 193: 1269-1284. Ulivieri, C., A. Peter, E. Orsini, E. Palmer, C. T. Baldari. 2001. Defective signaling to Fyn by a T cell antigen receptor lacking the α-chain connecting peptide motif. J. Biol. Chem. 276: 3574-3580. Backstrom, B. T., B. T. Hausmann, E. Palmer. 1997. Signaling efficiency of the T cell receptor controlled by a single amino acid in the β chain constant region. J. Exp. Med. 186: 1933-1938. Teixeiro, E., M. A. Daniels, B. Hausmann, A. G. Schrum, D. Naeher, I. Luescher, M. Thome, R. Bragado, E. Palmer. 2004. T cell division and death are segregated by mutation of TCRβ chain constant domains. Immunity 21: 515-526. Backstrom, B. T., B. Rubin, A. Peter, G. Tiefenthaler, E. Palmer. 1997. T cell receptor α-chain tail is required for protein kinase C-mediated down-regulation, but not for signaling. Eur. J. Immunol. 27: 1433-1441. Geiger, T. L., D. Leitenberg, R. A. Flavell. 1999. The TCR ζ-chain immunoreceptor tyrosine-based activation motifs are sufficient for the activation and differentiation of primary T lymphocytes. J. Immunol. 162: 5931-5939. Haks, M. C., T. A. Cordaro, J. H. van den Brakel, J. B. Haanen, E. F. de Vries, J. Borst, P. Krimpenfort, A. M. Kruisbeek. 2001. A redundant role of the CD3 γ-immunoreceptor tyrosine-based activation motif in mature T cell function. J. Immunol. 166: 2576-2588. Voss, R. H., R. A. Willemsen, J. Kuball, M. Grabowski, R. Engel, R. S. Intan, P. Guillaume, P. Romero, C. Huber, M. Theobald. 2008. Molecular design of the Cαβ interface fururs specific pairing of introduced TCRαβ in human T cells. J. Immunol. 180: 391-401.